Nat is setting the challenge at Daring Cardmakers this week and she'd like to see some ink blending going on. I've resisted the lure of the new Distress Oxides so I reached for my trusty old Distress inks and a sponge, splattered some water and then sat and looked at it for ages, completely at a loss what to do with it. I ended up going very simple with a stamped image and a "hidden" die cut sentiment. The word is intended for Christmas cards but I thought it would suit a peaceful image, too! Thanks for stopping by, hope your weekend is a peaceful one! 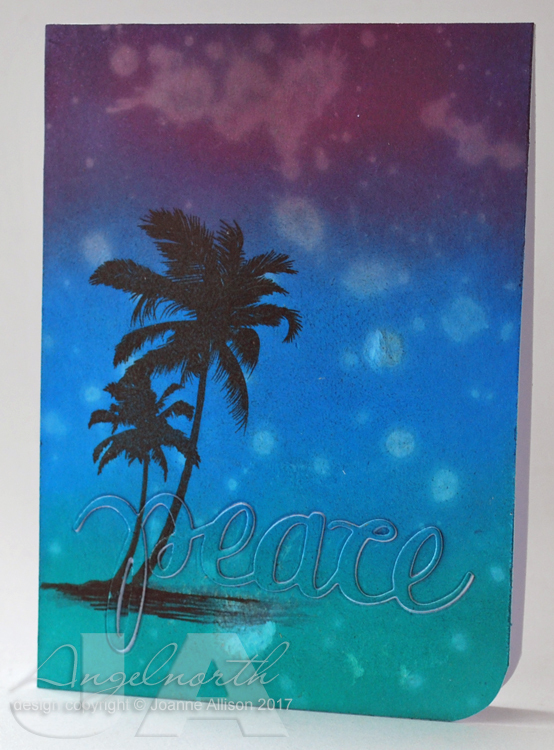 Stunning use of colours Joanne, I absolutely love this take on that WMS palm tree stamp - I think it could definitely work as a Christmas card too. Fab stuff and A+ blending skills with the original Distress Inks! Stunning! The way you've incorporated the sentiment is just marvelous. Love it. lovely blending - most envious of this skill!